Born in Caherciveen in 1966, Rachel grew up in Dublin and graduated with a Degree in Sculpture from National College Of Art & Design in 1989. Joynt’s work is predominantly site-specific; this goes for both her sand installations and public artworks. Her installations include ‘Selene’ at Project Art Centre in ’93 and ‘Feed’ at Temple Bar Galleries in ’99. Her public artworks include ‘People’s Island”88, ‘Mothership’ at Dunlaoghaire seafront in ’99, ‘Starboard’ alongside the River Lagan, Belfast, 2001 and ‘Noah’s Egg’ outside the Vetinary building, UCD, 2004. Some of her public artworks are highly visible such as the sea urchin ‘Mothership’ or ‘Noah’s Egg’ (a 3.5 meter long bronze egg textured with various animal sperm and perforated with small holes. When viewed through the eyehole this creates a celestial space inside) A large number can also be discovered underfoot, these include ‘Starboard’ in Belfast and ‘ArcHive’ at Pearse St library in Dublin. Both these works use cast glass housed within a cast iron frame and then lit from below. 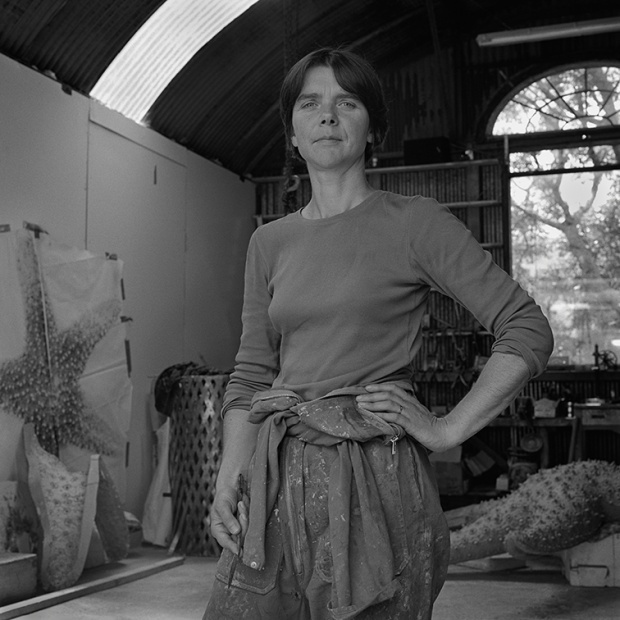 Her recent commissions include ‘Freeflow’ a glass cobble, illuminated work sited intermittently underfoot from IFSC to the Point Theater in Dublin, ‘Love All’ a bronze globe in Templeogue village and ‘Guiding Star’ a large cast iron starfish as if dancing over the harbour wall at Port Oriel fishing harbour in Co Louth. 1984 – ’89: BA First Class Honours Degree in Sculpture, N.C.A.D. Dublin. 1988: Exchange student, Edinburgh College of Art, Scotland. 1999: ‘FEED’ Installation, Temple Bar Gallery and Studios, Dublin. 1993 – ’94: ‘SELENE’ Installation, Project Arts Centre, Dublin, Arts Council Gallery, Belfast. 2000: Fusion, Dunamaise, Theatre and Centre for Visual Arts, Portlaoise. 1999: Multiples X, Temple Bar Gallery and Studios. 1997: ‘Critics Choice’, RHA, Gallagher Gallery, Dublin. 1996: RHA Annual Exhibition, RHA Gallagher Gallery, Dublin. 1996: NCAD 250 Drawings, RHA Gallagher Gallery, Dublin. 1994: Siolru ’94 RHA Gallagher Gallery, Dublin. 1993: Oireachtas ’93, RHA Gallagher Gallery, Dublin. 1991: Espace ’91, RHA Gallagher Gallery, Dublin. 1990: Sculpture in Context, Fernhill Gardens, Sandyford, Co. Dublin. 1987: S.A.D.E. Crawford Municipal Art Gallery, Cork. 2013: Instinct , walkway along river Moy, Ballina, co Mayo. Mayo Co council. 2007: Clutch Baltray, Drogheda, Louth, Co. Council. 2001: ‘Egg’ Redrow Homes, Cardiff, Whales. Cardiff Bay Arts Trust. 2001: ‘Starboard’ Gregg’s Quay, Belfast, Laganside Corporation. 1997: ‘Shoreline’, Strand Road, Derry, N. Ireland, Derry City Council. 1997: ‘Melt Down’, Newcastle upon Tyne Eco Centre, Collaboration. 1996: ‘Perpetual Motion’. Naas by Pass Collaboration, Kildare, Co. Council. 1995: Weather Vane & Pool, Dublin Castle, Office of Public Work (O.P.W.). 1994: ‘A Spine Path’, Library Headquarters, Clare County Council, Ennis, Co. Clare. 1992: ‘Red Stone’, (O.P.W.) Visitors Centre, Kilrush, Co. Clare. 1991: ‘Wood Key Walk’ Winetavern Street / Patrick Street project. Dublin Corporation, Public Art Panel ’91. 1990: Dublin Corporation. – ‘Solas na Glasrai’. The Green Light. Sited in ’92, Parnell Street / Moore Street, – 13ft Market Lamp. Traffic Island between Westmoreland Street / D’Olier Street. 2012: Artlinks Bursary, Carlow County Council. 1999: Visual Arts Bursary, Arts Council of Ireland. 1997: Joint recipient for ‘The Cream of Irish Awards in Sculpture ’97’. 1994: Macaulay Fellowship, Arts Council of Ireland. 1993: Arts Council of Ireland, Travel Grant. 1987: Bank of Ireland Bursary award, S.A.D.E., Crawford Gallery, Cork. 1995 – 1997: Teaching Core Studies, National College of Art & Design. 1990: Teaching, Douglas Hyde Gallery Workshops.